Yesterday 5 student athletes from Bishop Brossart signed letters of intent to play their respective sports at Thomas More College. 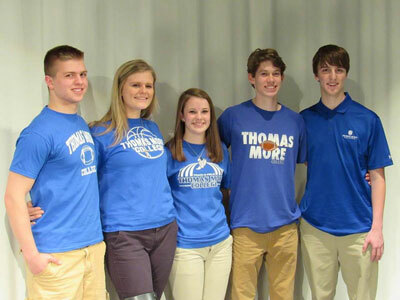 Three additional student athletes signed last week to play soccer; so there are 8 Brossart kids going to Thomas More College in the Fall to play their sports which is a little unique. Today, in front of a big crowd, FIVE BBHS seniors signed to continue their sports career at Thomas More College. Congatulations and good luck to these students!